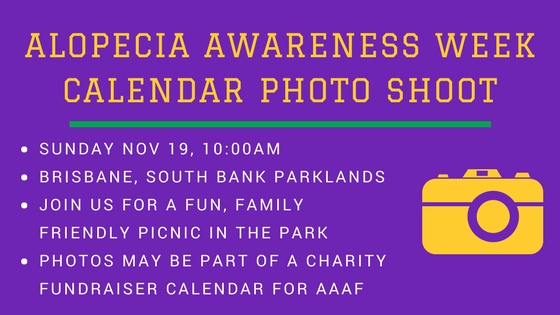 AAAF is putting together a charity calendar featuring beautiful photography of people living with Alopecia Areata. Come on down to the South Bank Parklands to take part in the project, and support raising awareness of this condition. If you don’t wish to have your photo taken, that’s completely fine. We’ll also be hosting a family friendly picnic and invite you to come along with friends and family for a wonderful day out celebrating Alopecia Awareness Week.